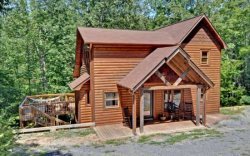 "Wine Down" is a beautiful and cozy log cabin in the North Georgia Mountains just minutes from downtown Blue Ridge and local attractions. Rustic & Antique decor throughout. Once entering into the gated stone entrance on the property and taking your first step inside the cabin, you will get an instant feeling of relaxation. As you tour around the inside of the main floor of the cabin, you will enjoy the open floor plan which includes the living room, kitchen, dining room, and the wood burning stone fireplace allowing for great conversation, watching tv, and enjoying one another's company. Sit back and relax on the comfortable outdoor couch filled with comfy pillows inside the covered screened in porch, while you enjoy and take in the peacefulness of nature and starry Georgia skies. You can also enjoy making dinner using the new gas grill while dining under the covered porch sitting at the teak dining set overlooking the forest. Off the back main porch is a fire pit with plenty of seating, which is great for those cool evenings to make s'mores, hot dogs and memories. One of the main attractions and more relaxing areas at Wine Down will be found on the lower level covered porch, where you will find a large hot tub, ample seating area for conversation, and full privacy for those needing to escape. Lastly, for those who are enjoying the upstairs master living suite, please indulge on the covered, outdoor private porch area which also includes an inviting and comfortable outdoor couch, too. This Blue Ridge Mountain Cabin Rental is located approximately 10-15 minutes from Downtown Blue Ridge, GA. The cabin is in the Cherry Log, GA area, which is very close to the USFS, Adventure Trail Rides for Horseback Riding, Blue Ridge Canopy Adventures, Firewire Zip Lines and Lake Blue Ridge. Also, the Benton McKay Trail runs adjoining to this property. Wine Down is very private and is in a quiet area which makes great memories for a Blue Ridge Cabin Rental. The lady I worked with was wonder! I needed an early check in and a last minute cabin and she made it happen. They made planning the surprise getaway very easy! !They even helped with the extra touches like the Champagne/chocolate basket. This was a surprise getaway for my husband. We needed time away together and change of scenery!! This cabin was the perfect choice for that! It was cozy, quiet and had just the right amenities. Very peaceful! I love the separate master bedroom and private patio.